My name is Keerthana Rachamadugu.I am from Bensalem, PA and went to Bensalem High School. I am a junior pursuing a Bachelor of Business Administration in Management Information Systems at Temple University’s Fox School of Business. I chose MIS because it is such a rapidly growing industry where my passion to innovate and improve technical and business operations would be fulfilled. I consider my strengths to be my creativity, hardworking nature, and ability to think logically. I am an active member of the Association of Information Systems and Business Honors Student Association. 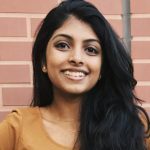 Please take a minute to explore the rest of my pages and my resume, or send me an email at Keerthana.Rachamadugu@temple.edu, if you are interested in learning more about myself and my career goals.